Yurts have always been popular as lightweight, economical, and portable shelters. Treehouses have always been popular as a way to express freedom, imagination, and a closeness to mother earth. Put the two together, and you might just have the perfect small house. 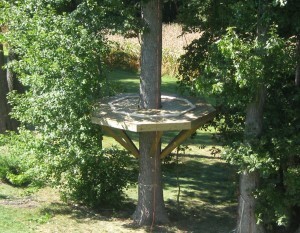 We partner with www.CampingYurts.com to make our tree platforms and yurts compatable with each other. Yurts can be installed onto the center of a multi-tree platform, or modified so that they can be installed around a live tree. There are many options to accessorize the yurts. We can connect them to each other with bridges, add wood stoves or portable beds inside them, and install hoisting systems to lift items from the ground up into the trees. Typically, you will buy a completed yurt from Camping Yurts and contract with Tree Top Builders to build a tree platform for you and install the yurt. However, there are a host of DIY and partial DIY options if you want to save some money by building your own yurt style treehouse. Camping Yurts also offers partial DIY kits if you want to do some of the woodworking yourself. Some parts are harder to make such as the roof ring or sewing the canvas, so you could still purchase these items in a kit and then make other parts per the plans/instructions. Camping Yurts will sell their yurts in any stage of completion to suit your budget & skills. We offer plans, tree attachment hardware (such as TABs & brackets), and top notch support for people building their own tree platforms. We also teach workshops for people who want some hands on experience before they tackle their own project.